Molting is the natural process of growing for a hermit crab. During this time, it sheds its exoskeleton and forms a new one. During the molting process, a hermit crab is very defenseless. A molting crab is under a lot of stress and extra care is required during this vulnerable time. The frequency of molting depends on the size and growth rate of each individual crab. Smaller crabs, that grow much faster may molt every 3-4 months. Larger crabs that grow much more slowly may only molt once per year. The first thing to remember is that when molting, a crab will bury him or herself; do not move him or her! As hard as it is not to pick him up and look to see if he’s ok, you must be brave and let him do his thing. Molting may take anywhere from 4 to 8 weeks for the averagely sized crab. Smaller crabs may take a shorter time; larger crabs may take longer. They may stay buried the entire time. Another important thing to remember is that molting crabs are in danger from other crabs while they are molting. Other crabs may attack the molting crab while it is vulnerable. Always keep the molting crab in an isolation tank. Most pet stores have dividers available to section off one part of an aquarium from another. Once the process is complete, the crab should not just be put back into the main tank, as it takes awhile for the new exoskeleton to harden. The real way to tell if the crab is ready to be back in with the other crabs you may own is when they are active and appear healthy again. This process can take anywhere from a few days to a couple of weeks. Be patient and let your friend heal. A question you may have about molting is how you will know when your crab is going to molt. There are usually pretty obvious signs. Your hermit crab will most likely start to act a bit differently and look a bit different just before molting. However, though there are crabs who exhibit obvious signs, always be prepared for molting as some hermit crabs may surprise you by molting when you least expect it. Keep a close eye out for the following signs and be prepared to support your molting hermit crab through this stressful and vulnerable time. Once you see these signs, you should consider isolating the hermit crab from the other crabs right away. - Sluggishness or relative inactivity. - Eating and drinking significantly more. The crab may stop eating completely just before a molt. - Spends lots of time around water. - A molt sac, or water sac under the abdomen, may form. - Missing limbs may occur. - Whitish color on legs and claws. - Cloudy, whitish color to the eyes Legs may seem weak. - Eye stalks may face away from each other. Observe carefully for these signs of molting and offer your hermit crab support. Remember, isolate him, and leave him alone. These are the best things you can do for your crabby. You can find them almost anywhere near the seashore boardwalks. All you have to do is walk into a cramped little gift shop on the beach and you can find them, stuck in a 6"X 3" carrying cage and nothing else. If you haven’t looked there, all you have to do is look at the nearest wannabe pet shop. They are stashed on the darkest bottom shelf with tons of others, cramped in a small aquarium with a little water and food. Some of them won’t even venture out of their shells. Some of them are even missing limbs and claws. That’s right, I’m talking about hermit crabs. Before they even have a chance to be chosen by people from a caring home, they are already being mistreated wherever they are being sold. The cards are already stacked against them. Many pet stores treat hermit crabs as if they are simply stock. They take good care of their birds that are worth hundreds of dollars. Same goes for their expensive puppies and kittens. But where are the pet stores that care about pets down to the smallest and most inexpensive? Just because they don’t cost an arm and a leg to buy and care for doesn’t mean they don’t deserve to be cared for in the same way. As you know, temperature and humidity are key components to keeping a hermit crab healthy. Shoving a small aquarium on the darkest bottom shelf in the store, leaving the lid open with no humidity or temperature gauge, and not even caring to regulate temperature and humidity is total, undeniable hermit crab abuse. Unfortunately, there isn’t a big organization to make pet stores treat these small creatures humanely. The SPCA won’t come barging indignantly into a pet store treating hermit crabs horribly. This isn’t something that is important to very many people. If you are interested enough to purchase a hermit crab from a pet store, most of the time you won’t get any information or fact sheet about your pet. If you question the store clerk about tank conditions or ask the pros and cons of certain types of diets, you are dismissed because the clerk doesn’t know anything about the pets they are selling or just flat out do not care to learn. They see hermit crabs as a "disposable" pet. You know... the kind people buy and just in case they don’t take care of it and it dies, it’s ok; they are cheap and they can simply replace it. The pet store associates themselves even say that hermit crabs do not last as pets. Not only do some people believe this way, some pet stores having a return policy for defective animals, are used when the crab is mistreated, dies within the 30 days, then is taken back and another victim is chosen. This should never be the case. Hermit crabs can live 15 to 20 years or more if taken care of properly. It is unfair to treat any creature this way. These animals are living, breathing creatures and deserve to be treated fairly. They didn’t ask to be plucked from their tropical climates. They didn’t ask to be bread in captivity for eventual sale. They are simply creatures that exist and deserve to be treated with care. Please don’t think that if you purchased a crab and it died and you replaced it that you are necessarily in the same category as these impatient, uncaring pet owners. Many times, the hermit crabs are so stressed out from the horrible treatment they receive while they are waiting to be sold that they just can’t handle being moved to a new location. Besides the fact that most pet store clerks don’t handle or feed or house them correctly, they don’t monitor the patrons who handle them, either. For example, the pet store I’ve been referencing about keeping the hermit crabs in a dark, hardly suitable atmosphere is the same place I found one of my hermit crabs, who was already missing a limb from stress. Instead of the crabs being in a place where they and the people handling them can be seen, these hermit crabs were on the last row so that no one could see who was picking up the hermit crabs. Unruly and unsupervised children and uncaring, ignorant people are both fully capable of accessing these creatures without supervision from a pet store associate. This means that they are fully able to roughly handle, terrify, and drop the hermit crabs that are for sale. If you researched hermit crab care, purchased a hermit crab, took it directly home, and began caring for it, and it still died, chances are, that it wasn’t you who contributed to the tragic demise of your hermit crab. If any of this has happened to you, don’t blame yourself. The best thing you can do is find a reputable pet store and do research about it before you make a decision to purchase any pet from it. Take the time to look at the way the crabs are displayed to sell. Ask associates if they are sitting in temperature and humidity controlled climates. If not, strongly consider not purchasing from this store. Do research on hermit crab care, and question store associates to see if they know what they are talking about. Do your homework. In the end, you will be a much more satisfied pet owner. If you have that tendency to attract strays, you might consider going to that awful pet store and saving some of those poor hermit crabs. An idea to help you with this is to put the crabs from that store in their own cage. Leave them separate from your healthy hermit crabs. As you observe, remove the crabs that are healthy and place them in with your current crab habitat. You can try to nurse the unhealthy ones back to health. It is a brave endeavor, but might not always turn out the way we would like. But if you are willing to try to save these animals, they are much better off with you than a person who won’t care for them. Whatever you decide, just remember that these are living beings. They deserve to be treated as such. Hermit crabs are a fascinating species of animal to keep as a pet. Like any other pet, a land hermit crab must have the proper care, environment, and food in order to not only survive but to thrive. A very important component of hermit crab pet care is the environment. If the hermit crab is not in a safe and healthy environment, it is nearly impossible for a hermit crab to stay healthy. 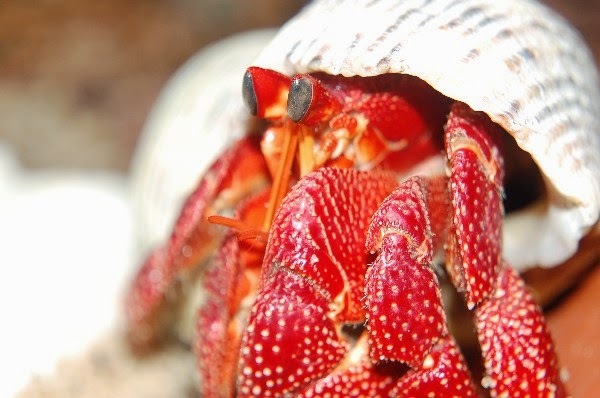 There are three main components to the environment a hermit crab should live in: the tank and its furnishings, the substrate, and the temperature and humidity of the environment. The first part of the environment of a hermit crab is choosing the type of tank and its furnishings. Glass or plastic tanks can be used as homes for hermit crabs. A 10-gallon glass aquarium is definitely a more than the adequate location for your hermit crab. Plastic tanks that are obtainable have lids and have become quite common and are usually available on the shelves of your local pet store. Any container that has a mesh or slotted lid does not retain humidity well, and therefore is not as ideal as containers with solid lids. Many pet stores will actually sell you a hermit crab in a small hermit crab kit, including a very small cage. While this small cage is ideal for a temporary home for your crab, it certainly is not appropriate for any type of permanent housing. These cages are far too small and cramped to be a permanent home. As was mentioned before, a 10-gallon size container is appropriate, but the bigger the cage the better. Also, take into consideration the number of hermit crabs you will be housing when considering the size of the tank. Besides the size and type of tank, you will house your hermit crab in, there are a few things to include in the tank. In addition to the obvious food and water dishes, hermit crabs need "furniture." They are generally very active creatures and love to have toys to climb on. Artificial plants, climbing toys, and small logs are great ideas to place in your hermit crab’s environment. As well as having toys, a hermit crab needs at least one place that he or she can hide away in. A hollowed out and sealed coconut, small cave structure, or other shelters are encouraged. Another part of the hermit crab’s environment is the substrate. A substrate is a material in the bottom of your hermit crab habitat. There are several different types of substrate to choose from. One type of substrate that is acceptable is fine-grained sand. Another selection you might make is a fine-grained gravel specifically sold for hermit crab substrate. The last option is a material made of coconut fiber, which is completely organic. Any of these types of substrates are completely adequate to lay in the bottom of your hermit crab habitat. The final piece of the hermit crab environment is the temperature and humidity levels required for a healthy hermit crab. An optimal temperature in the hermit crab habitat is approximately 72-80 degrees Fahrenheit. If the temperature is constantly measuring outside of this zone, a heater may be required to keep you crabby warm. Humidity is another important aspect of crab environment. You can use a humidity indicator to tell what humidity range your tank falls in. Generally, a humidity range of 70%-80% is the healthiest because hermit crabs are used to living in tropical climates. Whatever combination of these options you choose, the keys to making sure you have a great habitat for your crab to live in is that you have the right tank and tank furniture, substrate, and temperature and humidity levels. Keeping your eye on these variables will give your hermit crab a great environment. Hermit crabs are fun pets to care for in your home. They used to be reserved for souvenirs from seaside vacations, but now they can be bought almost anywhere. They make wonderful starter pets for kids. They make a great alternative to the more traditional gerbils or hamsters, and they have a much longer lifespan than goldfish! Contrary to what you might expect if you are new to hermit crabs, it is possible to play with them, and they do have little personalities of their own. Do you think hermit crabs may make a great pet for you? Here are some helpful hints to get you started. Before you get your crab, you need to get the basic equipment and supplies in place. First, they will need an aquarium for their house. Forget those teeny, tiny cages you see at the shops by the beach; hermit crabs really need a ten-gallon aquarium to be comfortable. If you are getting more than one crab, obviously you will be a bigger aquarium. A pet shop will be able to advise you on the best size for the number of crabs you will be housing. Make sure the aquarium has a snug fitting lid so your little friends do not make a run for it! Place a heating pad under the tank to keep your crabs feeling nice and tropical. You will need something to cover the floor of the tank, as well. Three to four inches of sand works best, but you can also use crushed coral or reptile fiber bedding. If you use something other than sand, it is still a good idea to cover a portion of the floor with sand, so the crabs will have somewhere comfortable to go when they molt. Now that you have the house and the flooring covered, you will need to get two shallow water dishes and a food dish. Shallow shells work well for this job. In one water dish, you should keep fresh water, and in the other, keep salt water, made with a marine aquarium salt solution. The dishes need to be shallow enough for the crabs to crawl into. A natural sea sponge is a nice addition to the freshwater dish, your crab will love to pinch it, and it will help keep the humidity levels up the aquarium. The last thing you will need to gussy up your hermit crab home is some decorative wood pieces for the crabs to climb on. Coral and coconut shells also make great additions that your crab will love to play with. Once you get your crab, to feed it, you will need to get some commercial hermit crab food. You can supplement that food with small pieces of fruit, meat, cereal, or fish. Additionally, make sure your crab gets crushed eggshells or oyster shells to boost their calcium level; it is important to keep their fragile skeletons strong. Cuttlebone is another option for this purpose. To care for your crab, clean their water and food dishes daily, and spot the clean the tank when necessary. You will want to provide plenty of extra shells, in increasingly larger sizes so your crab can change homes as they grow. Shells with wide openings are best. When your crab molts, remove the skin they have shed as soon as possible. One optional, but a useful accessory to get is a tank thermometer and humidity-measuring tool. Your hermit crab will be most comfortable when the temperature is kept around 72°F - 80°F and the humidity level is between 70% and 80%. With these helpful hints, you are ready to get your hermit crab. All that is left to do now is come up with a name for your new pet! In nature, a hermit crab is omnivorous. This means that hermit crabs eat a little of everything including plants and meats. While they are in captivity as a pet, their diet should either be based on a commercial diet with crab food and supplements of natural foods, or a natural diet consisting of foods you yourself might eat. Whatever you feel is best for your hermit crab, they are both adequate to nourish your crab. As far as commercial food goes, there are several different types of crab food. Ask your local pet store specialist which they would recommend. Crab foods come in pellets or granules. If you are planning to use pellets, they should be crushed into a powder, to make it more easily accessible for your hermit crabs, especially if you plan to purchase a small crab. You can feed other commercial pet foods like reptile food or fish flakes. Whichever you choose, commercial foods need to be supplemented by natural treats. Veggies and fruits are great supplements to a commercial foods diet. Cooked chicken is also a great thing to treat your crab to every now and then. Commercial diets are very convenient and most are fairly well-balanced. However, the best diet for your hermit crab is a diet full of natural foods only. Fruits that may be fed include mango, papaya, coconut, grapes, and bananas. Veggies that are appropriate to feed your hermit crab are carrots, spinach, broccoli, and seaweed. There are many more foods that are available to feed your hermit crab on a natural foods diet. A care sheet containing all the available foods can be picked up at most decent sized pet stores. Avoid starchy veggies like potatoes as well as avoid dairy products. You might find that your crab likes sweets or salty junk food. This should be rarely given for snacks, as it is not good for the hermit crab anymore than it is for people. Besides being fed, hermit crabs need calcium. Some ways to provide calcium for your hermit crab are cuttlebone, found in most pet stores in the bird section. This can be broken up or given whole. There are also calcium supplements that can be given to the hermit crab besides cuttlebone. Also, crushed oyster shell, coral sand, and cleaned crushed eggshells all contain calcium for the hermit crab. Besides food and calcium, hermit crabs need water. Purified water is the only water that will do. Chlorinated water is not acceptable to give to hermit crabs because it can harm their modified gills, causing blisters on them if repeatedly exposed to it. Needed is a water dish large enough for the required natural sponge and for the hermit crab to soak in. Be careful to offer a place for smaller crabs to get out of the dish so they do not drown. This first water dish is to contain fresh water. There is needed a second dish that should contain salt water, for the hermit crab. They have access to the saltwater in their natural habitats. A sea sponge should also be placed in this container as well. Feeding and providing water for your crab is a vital part of the hermit crab’s survival. Research as much as you can where this is concerned, as hermit crabs are not just throw away pets. Pets have made a difference in many people’s lives for a long time. The most popular pets have been pets such as cats, dogs, and fish. Within the past few years or so, Land hermit crabs have become a very popular pet in the small pet market. Many people have realized that they make fascinating pets. If a person decides to make the choice of a land hermit crab for a pet, there are several ways to make sure the crab is comfortable, healthy and happy. These ways include making sure the hermit crab has proper food and water, the proper environment and proper hygiene and care. One of the first ways to keep a pet hermit crab healthy is the proper hermit crab food. Many people have many different ideas about the healthiest diet for a hermit crab. There are three popular diets for land hermit crabs. One diet choice is simply to feed your land hermit crab basically the same things you eat. Numerous people feel that feeding hermit crabs small bits of cooked meats, raw veggies, and fresh fruit is the best way to nourish your crab. This is, indeed, a healthy way to feed your crab because, in the wild, hermit crabs are scavengers. They are definitely not picky creatures. Other popular diet choices include fish flakes and crab food pellets or granules. These are also acceptable ways to nourish your crab. Whatever type of diet you choose for your pet, a treat every now and then is a great way to break up your hermit crab’s diet. Small pieces of fruit and veggies and the occasional piece of cooked meat are great ideas for treats. Water should be clean, fresh, dechlorinated water. Dechlorinators are available but can become expensive over time. Bottled, filtered water is acceptable. A dish of salt water and a dish of fresh water is required to drink and soak in for your crab. Another way to be able to keep your hermit crab healthy and happy is to make sure your crab has the proper environment in which to live. To make your hermit crab habitat, needed first is a container. A housing can be as basic as a 10-gallon aquarium or a reptile habitat. Make sure your crab habitat is roomy enough for toys and food and water dishes. Your crabby also needs room to roam. If you wish to get more than one hermit crab, which is recommended because they are very social creatures, you must keep this in mind when thinking about space in your crab habitat. Other environmental issues exist. The substrate is what goes in the bottom of the habitat. Sand, coconut fibre, or small crab gravel can be used. Humidity and temperature should be approximately 70% and 72°. This is important to keep their gills moist and to give them an environment to which they are adapted. Toys are very important to keep the crab happy. Things to climb on, hide under, and push around are great things to put in your pet’s habitat to increase the hermie’s enjoyment. The third basic thing that is needed is proper care. Proper care of your crabby includes bathing it once a week in purified dechlorinated water, feeding according to the directions of the chosen diet, spritzing your crabby and its environment to keep constant humidity, and paying attention to your little friend. These are the basics when it comes to keeping your hermie very healthy, happy, and comfortable. There will be more information needed and research that needs to be done to be a great caregiver, but this information will get started and on your way to being the proud owner of a terrific pet that can provide great entertainment and can be a rewarding experience. Hermit Crabs are great pets. What Types of HERMIT CRABS Should Be Placed in a Saltwater Aquariums? Hermit crabs have been popular pets for adults and children alike for many years, and there are many who appreciate their unique beauty (and just as many do not-it's a matter of taste). With the increasing popularity of bringing a piece of the sea into the home, it is no wonder that the notion of introducing hermit crabs into a saltwater aquarium has been gaining in popularity. Just as there are many types of hermit crabs that can be kept as pets, so too are there many different breeds which can be kept in aquariums. Not all have the same chance for survival if kept in captivity, however, and it is important that the aquarium owner make sure that they are familiar with all of the specific needs of their hermit crabs before they are introduced to the aquarium. Below is an introduction to some of the most common breeds of aquarium hermit crabs. - Red Hermit Crab (Dardanus megistos)- Also known as the White-Spotted Hermit Crab this crab has red legs with black-edged spots. It is not a safe addition to a reef aquarium but is very useful in keeping algae growth to a minimum in a community aquarium. Only one crab per aquarium please; these crabs are very protective of their personal space. - Red Legged Hermit Crab (Clibanarius digueti)-these Mexican crabs are a hardy addition to any aquarium, eating algae from the tank. They demand a low level of copper in the water, however, as their bodies cannot survive in the presence of this metal. - Scarlet Hermit Crab or Reef Hermit Crab (Paguristes cadenati)-this hermit crab generally remains small, around two inches across, and has a red body with yellow eyestalks. They are very helpful in keeping the algae growth inside the aquarium under control; however, if insufficient algae are available inside the tank they must be supplementally fed with dried seaweed. - Common Hermit Crab (Pagurus bernhardus)-These crabs are more common in Europe but can be found in other countries as well. Also known as the soldier crab. Since these crabs carry their homes around on their backs it is important that they constantly have new shells available to them when they have outgrown their previous shell. A hermit crab in an improperly sized shell cannot grow properly. These shells can be purchased from a pet store or an online retailer or, if the owner is familiar with the requirements of their hermit crabs, these shells can often be found on a beach. If the owner chooses to go out into the wild and collect their own shells it is important that they choose the proper type of shell for their hermit crab to inhabit. As sea anemones are often an important part of the hermit crabs natural environment they make excellent tank mates, eating the leftovers when the hermit crab has finished a meal and cutting back on the amount of tank waste. Hermit crabs are an intriguing addition to any tank and require very little maintenance once their owners are familiar with their needs and their habits. With the proper care, they can live for quite a while, providing endless hours of joy for their owners and their families. A hermit crab is a truly exotic pet. They might not be the first exotic pets you think of when you first think of exotic pets. You might first think of a tarantula, an iguana, or maybe you even know someone with a scorpion. While these pets are all most definitely exotic, hermit crabs are the definition of exotic. They generally come from a tropical climate where humidity and temperature are high in the daytime and where the evenings are just as muggy. Hermit crabs unquestionably fall into the category of the more unusual pets, such as those mentioned before. They make interesting, easy-to-care-for companions and, like any other pet, have their own personalities. By nature, they are active and curious. The unique characteristics displayed in each hermit crab, plus the fact that they are low maintenance, make them the perfect pet choice for many people. Hermit crabs are not what we think of when we think of traditional crabs. They have a much smaller, softer abdomen than the typical crab. Because the abdomens of these crabs are soft and small, they are vulnerable, so they must be protected. The way a hermit crab protects its body from the elements and predators is by taking up residence in a snail shell that has been previously discarded. As hermit crabs age and grow, they must continuously find new shells in order to have a shell that fits each time the crab grows a little. Therefore, hermit crab pet owners must provide a selection of hermit crab shells for your pet to choose from. The hermit crab will be able to choose the perfect size shell to fit comfortably on its body. Hermit crabs, in the wild, are omnivores, meaning they eat a little bit of everything. They eat meats, vegetables, and fruit. They scavenge eating whatever they can find in order to survive. When you own a hermit crab, they can eat crab food with healthy veggie and meat snacks, or to take more time, you can feed them a balanced diet of what you might eat, such as grapes, carrots, and chicken. As far as the type of hermit crabs that are usually found as pets in the United States, there are both land hermit crabs and marine hermit crabs. This article specifically talks about land hermit crabs, as the care for marine hermit crabs is much different. The two main species of hermit crabs that are the most popular in the U.S. are Coenobita clypeatus, also known as Caribbean crabs, land hermit crabs, or tree crabs. The other species is Coenobita compressus, also known as the Ecuadorian species, or known as E-Crabs. There are other species kept as pets in other parts of the world and can be found in the U.S. such as the Australian Hermit Crab and the Strawberry Hermit Crab. Though these species are generally found as pets in other places besides the United States, in larger pet stores in the U.S., different species are often available. For the most part, land hermit crabs are easy to find in pet stores these days. They are becoming increasingly popular pets. One of the most important things to consider when selecting a pet is the care involved. If you are a busy person and don’t have time to put into a more needy pet, a hermit crab is relatively self-sufficient, and therefore an ideal pet for a busy person. At the time of purchase, check to make sure 3 sets of crab legs are present, he/ she is not damaged, and that there are no visible parasites. Try to pick a lively crab, and remember that the larger crabs are sturdier and less susceptible to disease and death. Whatever hermit crab you decide to choose, pick one you will love. Hermit Crabs have no directly relation to crabs. They come from the super family Paguroidea. They are named as ‘hermit’ crabs because it is their characteristic to occupy abandoned seashells. They do this to protect their delicate abdomen. 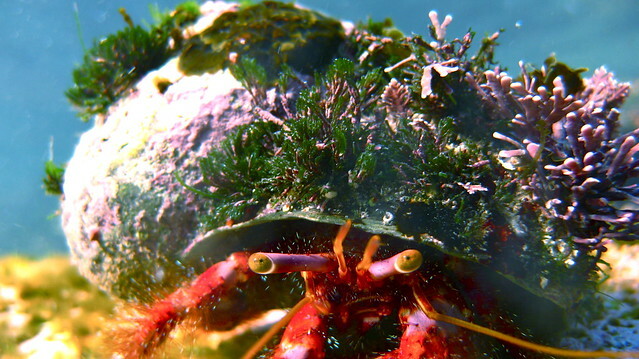 Nearly five hundred species of hermit crabs are known to exist and most of them live in water. They live in colonies of approximately hundred occupants. As the hermit crab grows it changes its shell and searches for a bigger one. Also, hermit crabs with well fitting shells grow faster than the ones with tight shell and the later ones becomes a prey very easily. But the availability of abandoned shells is less and hence the hermit crabs fight each other so as to get ownership of a shell. The number of shells available depends on the population of gastropods around. Very rarely do hermit crabs trade each other’s shells. The new shell will be selected if it is at least one-third bigger than the present shell. The hermit crabs also have a tough exoskeleton, which doesn’t grow with the hermit crab. But the crab shed this exoskeleton and grows another one very fast. This process is known as molting. Molting cannot be determined before hand, but hermit crab does become inactive and may bury itself in the gravel for two weeks. A small hermit crab molts once a month and larger crabs molt once every eighteen months. Hermit crabs are even kept as exotic pets. Pet owners like them because they are the one requiring least-maintenance of all the exotic pets. They do not grow more than the size of a peach and can be kept in a normal aquarium. They are scavengers and feed on algae and debris formed in the aquarium. Many of the species of the hermit crabs are part of the marine aquarium trade, some are herbivorous and some are omnivorous. Blue legged crab, zebra hermit crab, red reef hermit crabs, common hermit crab and red tip crab some of the types of hermit crabs which are kept as pets. The most desirable of them is the red reef hermit crab or scarlet hermit crab. It has a bright red body with yellow colored eyestalks. But some even grow to nearly twelve inches and feed on clams, corals, and crustaceans. The aquatic hermit crabs live in salt water with salinity ranging from 1.023 to 1.025. The temperature should vary from seventy-five degree Fahrenheit to eighty degree Fahrenheit for the tropical species. The aquarium gravel bed should be filled with algae and they should also be provided with different types of shells for the hermit crab, to choose from. If they have a larger option they will change their shells frequently, which is an interesting activity to be watched. Food dishes can also be added as a landscape, but the dishes should be low so that the hermit crab can climb out of it. Even other activities like digging, climbing, etc. are very interesting to observe. They should be fed and watered daily. Commercial food is available at the pet store. But along with that, fresh vegetables and fruits can also be added to the diet. Care must be taken that the fruit or the vegetable shouldn’t be left in the aquarium for more than one day or else it will contaminate the water. The gravel must be removed and the tank should be washed every month. They also must be watered, meaning that everyday they need to be sprinkled with lukewarm water. This applies for land hermit crabs. It is very easy to train a hermit crab. Training is more like playing. The hand must be held out and the hermit crab must be allowed to crawl on the palm. If the hermit crab pinches and doesn’t let go, run the area under a little lukewarm water and it will immediately let go. Hermit crabs have been popular pets for adults and children alike for many years, and there are many who appreciate their unique beauty (and just as many do not-it's a matter of taste). With the increasing popularity of bringing a piece of the sea into the home it is no wonder that the notion of introducing hermit crabs into a saltwater aquarium has been gaining in popularity. - Red Hermit Crab (Dardanus megistos)- Also known as the White Spotted Hermit Crab this crab has red legs with black edged spots. It is not a safe addition to a reef aquarium but is very useful in keeping algae growth to a minimum in a community aquarium. Only one crab per aquarium please; these crabs are very protective of their personal space. - Scarlet Hermit Crab, or Reef Hermit Crab (Paguristes cadenati)-this hermit crab generally remains small, around two inches across, and has a red body with yellow eyestalks. They are very helpful in keeping the algae growth inside the aquarium under control; however, if insufficient algae is available inside the tank they must be supplementally fed with dried seaweed. Hermit crabs are an intriguing addition to any tank, and require very little maintenance once their owners are familiar with their needs and their habits. With the proper care they can live for quite a while, providing endless hours of joy for their owners and their families. As a potential hermit crab owner, you might be wondering if there is a limit to the number of hermit crabs you can have in a certain amount of space. This is something I first wondered when I started keeping hermit crabs as pets. There is no really easy way to answer that question with exact numbers and measurements. The best number of hermit crabs to have for a certain amount of space all depends on the type of situation you have, space-wise. When deciding how many hermit crabs you can house, you have to consider tank size, personal space, and furnishings. 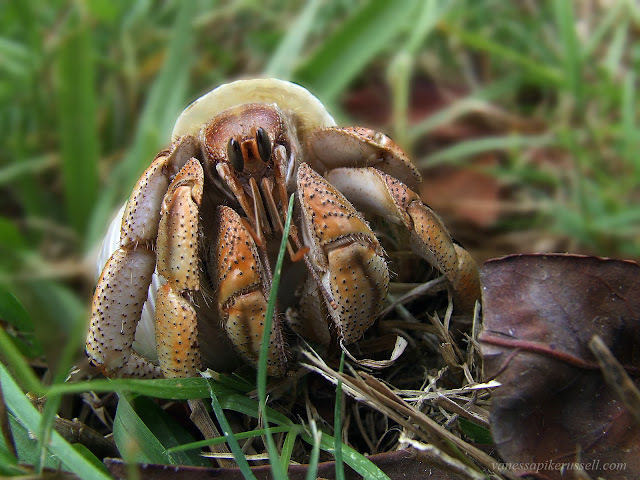 "Caribbean hermit crab" Licensed under CC BY-SA 3.0 via Commons. The first thing you need to consider when you are trying to determine how many hermit crabs you can house is tank size. This is a factor. If you have the minimum 10-gallon aquarium, you are most certainly not going to be able to house as many hermit crabs as a person with a 150-gallon aquarium. The small hermit crab kit cages are most certainly not adequate for one hermit crab to live in comfortably, let alone more than one. A 10-gallon aquarium is the smallest recommended to house a single crab and be able to expand your crab habitat somewhat. Another thing you must take into consideration when deciding how many hermit crabs you want to buy is the fact that, while hermit crabs are social creatures, they must be able to roam around in their own personal space. Many pet stores have an appropriately sized aquarium for a few hermit crabs, but they have the audacity to jam it full where the hermit crabs are forced to live on top of each other. This is an unacceptable situation for anyone to have, but especially pet stores that are supposed to be humanely housing their stock of animals. You have to take into account if each of your hermit crabs will have enough room to go off on their own for a little while. Each crabbie should be able to have some alone time now and then. Another thing to consider is that, if you are a keeper of hermit crabs for any length of time, you will inevitably run into a crab that must go through the molting process. You need to make sure that in your hermit crab habitat, there is plenty of room for a safe molting haven. If the hermit crabs do not have the space to molt, they can not molt safely, away from other hermit crabs. Also take into account that if you have quite a few hermit crabs, more than one crab may molt at the same time. You must allow for this. Another thing to think about is whether or not you want a variety of different size crabs. One last thing to consider when making sure to purchase a home big enough for the amount of hermit crabs you want to buy is to consider the furnishings that must go into the tank with the hermit crabs. Remember, you will have food and water bowls, climbing toys, shelters and other decorations in your tank. In order for your hermit crabs to live comfortably around these things, you must take this into consideration as well. You also want to make sure the hermit crabs have space to take a run as well as the space to maneuver between objects without getting stuck. One more aspect of spacing the furniture is that you need to keep things in the central part of your hermit crab habitat. 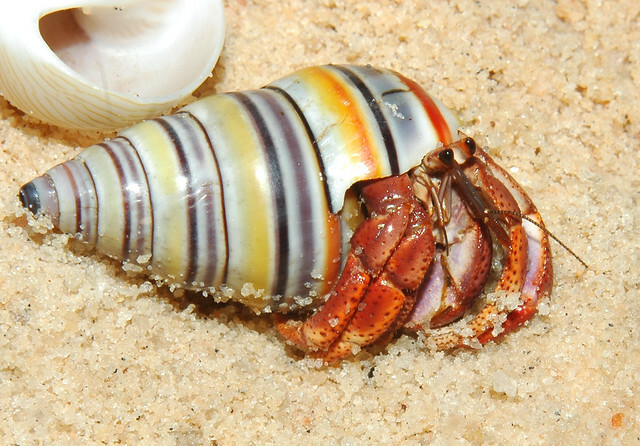 If you set items near the edge of the habitat, hermit crabs are more prone to escape. Though there is no set number of hermit crabs per gallon like goldfish have, the biggest thing to remember is to use your best judgment and common sense. Don’t allow the hermit crabs to be so crowded that they cannot maneuver around each other or their furnishings. Make sure everyone has a spot to call their own. Just keep the comfort of your hermit crabs in mind when deciding on the number you can care for.